Craving mouthwatering pizza? 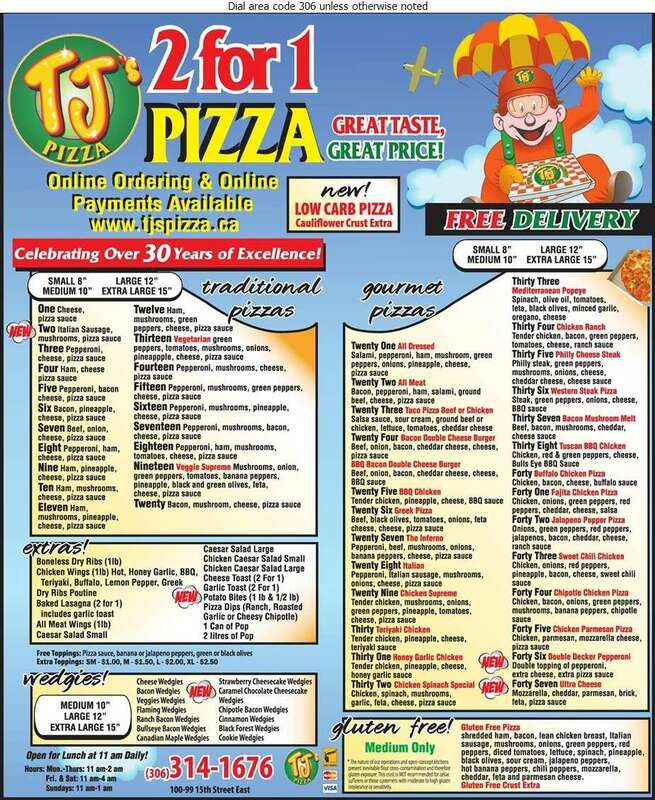 At TJ's Pizza in Prince Albert, we offer a variety of 2 for 1 pizzas that are made fresh daily. We start our pizza off with handmade pizza dough and fresh pizza sauce blended with our own secret spices! Then we top it all off with fresh toppings and cheese. We offer 38 different kinds of pizza, all available in small to extra-large sizes. Some of our most popular pizzas include: all dressed, all meat and ham and pineapple. A variety of extras are also offered like boneless dry ribs, chicken wings, baked lasagna and more. Don't forget to try our dry rib poutine and bread wedgies unique to TJ's Pizza.